The stock of ExxonMobil Corporation (NYSE:XOM) has been lagging behind the shares of its integrated oil major peers over the past year. In fact, Exxon is the only major oil company that's seen a stock decline over that time span. Don't get discouraged, even though there are some very real reasons for the laggard stock performance. Here are three terrible reasons to sell ExxonMobil Corporation today. Exxon started 2014 with roughly $6.5 billion in long-term debt on its balance sheet. That's an important year because oil prices started a deep and prolonged tumble in the middle of it. In order to continue paying its dividend and investing in its business while oil prices were falling, Exxon needed to take on additional leverage. By the end of 2016, the oil giant had nearly $30 billion in debt, a $23.5 billion increase in just two years. That's a staggering figure, and for many companies, it would be a signal for investors to question an investment's financial strength. However, selling because Exxon's debt levels increased would be a mistake. The problem is that the absolute numbers don't give you enough information. In January of 2014, debt made up a minuscule 4% or so of Exxon's capital structure. In fact, if you add in the roughly $4.6 billion in cash the company had at the time, net debt was even lower. But after adding almost $24 billion in long-term debt, long-term debt still only made up about 15% of the capital structure. That's a modest level of leverage for any company. Yes, Exxon is more heavily leveraged today that it was at the start of 2014, but it is far from over-leveraged. In fact, its debt levels remain toward the low end of its peer group. And it's already starting to reduce its debt load, with long-term debt falling roughly 20% in 2017. Questions about the health of the company's balance sheet, which is just fine, aren't a good reason to sell Exxon. One of the more impressive aspects of Exxon over time has been how well it puts shareholder money to work. It has a history of leading the oil majors when it comes to return on capital employed (ROCE). That said, this figure dropped during the oil downturn. And now that oil prices have started to stabilize, Exxon's peers have begun to catch up, and even surpass it. There's no question that this is an issue to watch, but you have to keep perspective. Peers have simply caught up to Exxon's industry-leading metrics, not left the oil giant behind. And Exxon is well aware of the situation. It has set a goal of improving ROCE from the current mid-single-digit range to the low to mid-teens by 2025. The way it plans to get there is by investing wisely and leveraging its industry strengths -- notably its ability to successfully execute large and complex projects, and its expertise in drilling for oil. However, selling today because other oil companies are starting to improve their return on capital employed metric at a faster rate than Exxon would be short-sighted. Exxon is a giant, slow-moving ship. It may take a little time, but the company has a strong history of industry-leading returns, and it's too soon to suggest that has changed. Exxon's oil equivalent production fell about 1% in 2016 and nearly 2% last year. These are small numbers, to be sure, but Exxon's oil wells have limited lifespans. If it can't maintain or grow production, it has a long-term issue on its hands. Like the ROCE numbers, investors should be closely watching this oil giant's production. However, Exxon is also working on this issue, too. It currently has large projects in the works to deal with its production shortfalls. That includes deep-water projects in Guyana and Brazil, liquified natural gas efforts in Mozambique, and plans to materially increase its production in the onshore U.S. tight oil segment. However, it isn't planning to expand production at any cost so it can pump more oil. Exxon knows it needs to start growing production and has plans to do something about it. Image source: ExxonMobil Corporation. This is where production and ROCE meet. Exxon's goal is to use its technology to create high-return projects, notably focusing on investments where it is the controlling investor. That includes such things as three-mile-long lateral wells in U.S. tight oil plays and drilling in deep water regions that few companies can tackle. The problem is that often, these are multiyear projects that will take time to bear fruit. Yes, you need to watch production today, but that's not a good reason to sell. It's more important to keep an eye on the progress of Exxon's big investment plans. If those plans don't play out as expected, then you need to get concerned. When you see a company's stock lag behind its peers, you need to start asking questions. However, instantly jumping ship isn't always the best game plan. That's particularly true at Exxon today. 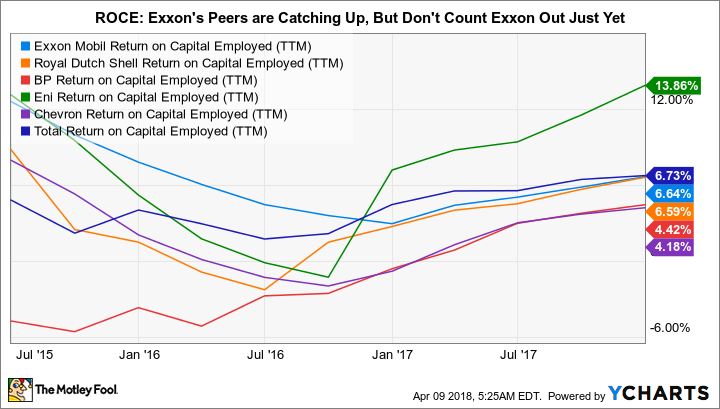 Yes, there are issues to watch, including an increased use of leverage, peers catching up to Exxon's industry-leading return on capital employed numbers, and declining production. But if you dig a little deeper, you'll see that Exxon is addressing all of the issues, and that they aren't as material as they may at first seem. It would be a mistake for investors to give up on Exxon today.